I still play Red Alert – a lot. While the Command and Conquer PC gaming RTS series has always been one of my all time favorites, the Red Alert niche has always risen to the top of that brand line as the cream of the crop. Maybe it is the Russian accents, or the hilariously bad acting. Probably it was, and still is because it’s one of the most enjoyable RTS series ever made – StarCraft included. Yeah, I went there. But you know where I wouldn’t dare to go? 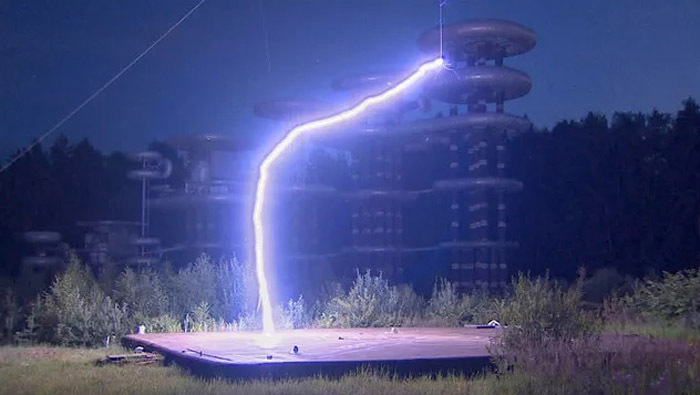 Within the max effective range of a real life Soviet Tesla Coil, because apparently these things are freaking real thanks to a recent drone video somewhere over in Mother Russia. According to the good folks over at MoviePilot, this real life Red Alert Tesla Coil has a no-kidding max effective range of 150 meters, which is nearly two football fields long for us non-metric, American folks. Insane, right? And while the technology surely is nowhere close to what it can do in Red Alert – like decipher enemy combatants from friendly forces, for example – the videos floating around from these things are absolutely insane. So in other words, while those of us who always played (and won handily) as the Soviets in Red Alert would always line our base perimiters with these bad boys, in real life maybe that’s not the greatest idea after all, eh Comrade?